The Academy of Culinary Arts at the Atlantic Cape Community College in Mays Landing hosted a Slow Food Sustainable Dinner which featured locally harvested food to celebrate World Food Day. The dinner was held in the schools award winning Careme’s Restaurant on the campus and prepared by the talented culinary students. The meal was served in a four course “farm to table” setting and included ingredients planted and harvested in Atlantic Cape’s organic greenhouse, responsibly harvested seafood and poultry, scallops from SeaSalt Supported Agriculture (CSA) Program at B & B Farms in Pomona. 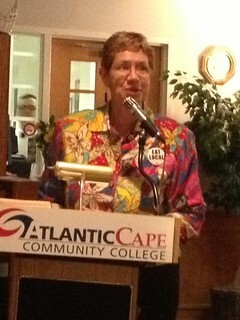 Proceeds from the dinner will benefit Atlantic Cape’s organic greenhouse on the campus grounds. Our student server Maria Nicastro (culinary students work front and back of the house to learn all aspects of the restaurant business in a hands-on style in the college’s program) treated us to warm, fresh out of the oven dinner rolls, light and flaky with picture perfect egg wash brown and glossy tops (It would have made the Pillsbury Dough Boy jealous). Then, came the first course of Braised Escarole and Navy Bean Soup which had a silky and flavorful broth with a hearty amount of greens and beans. 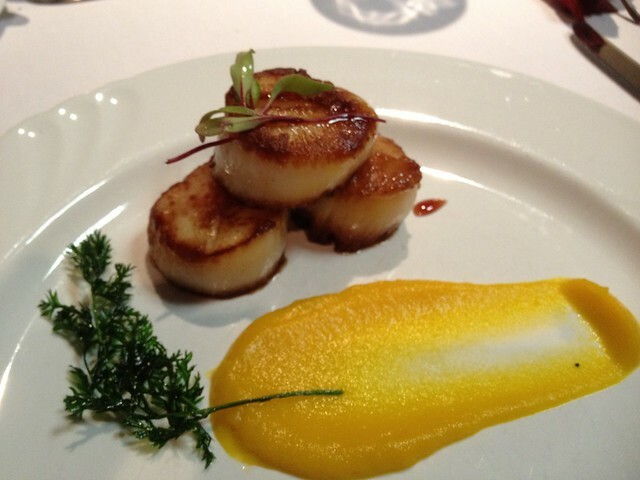 Next up, was a second course of Seared Cape May County Scallops with local pear and carrot puree, spiced port reduction and topped with young greens. The scallops were seared to perfection with just the right caramelization and so fresh and sweet you would have thought the boat was out back! Scrumptious! Third course consisted of Half Roasted Organic Chicken atop Potato and Pepper Hash in a natural reduction. 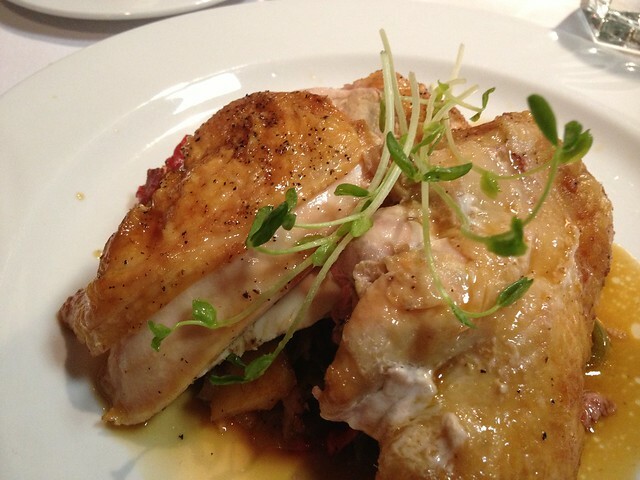 The chicken was tender, juicy, and nicely seasoned with a nice crispy skin and the hash was to die for! I made my husband give me most of his! I took home a silver swan with my leftover chicken for later. The dessert an Apple and Fig Cobbler with Vanilla ice cream and a drizzle of caramel sauce was just the right ending to an outstanding example of local bounty cooked to perfection by the culinary students of ACA. 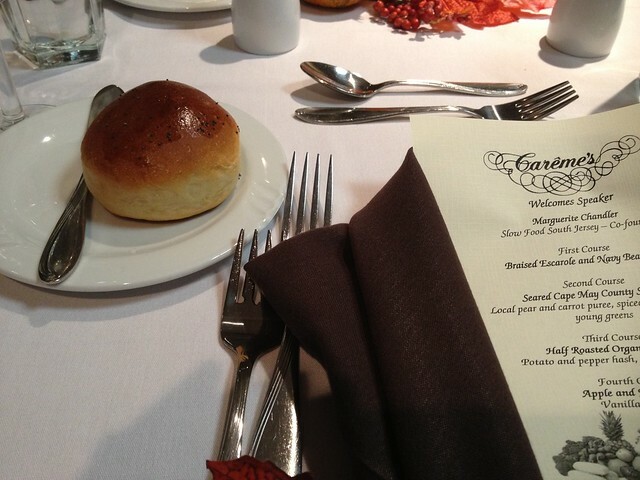 It is always a pleasure to be invited to Careme’s for any event as well as their regular lunch and dinner menu offered throughout the school year. Do not miss the chance to dine at the restaurant, as well as the Cafe series of eating events which features guest chef’s working in conjunction with the students. It is the most affordable luxury in fine dining you would expect to receive from only the best of restaurants! You can reach Careme’s for more information and reservations at 609-343-4940.